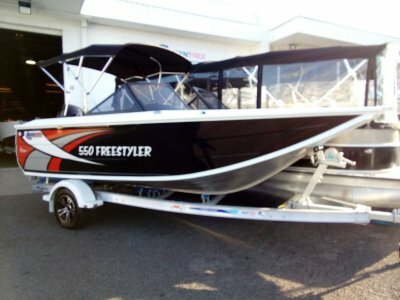 The 565 Offshore has a great roomy interior for a day out fishing, or just out with the family. Bolster seats with pedestals as standard provides plenty of cockpit space for added eskys and equipment. Fiberglass side pocket storage adds to the overall finish of the 565 Offshore and convenient for those much reach items. With a clean fishing platform the 565 Offshore has a large left up hatch for accessing the bilge. 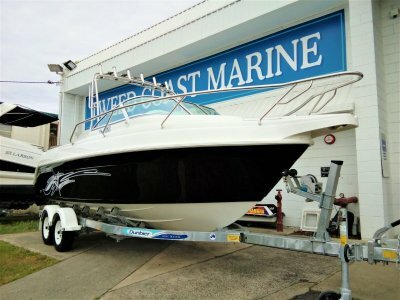 565 Offshore has the option to add a latched door to the walk through transom. 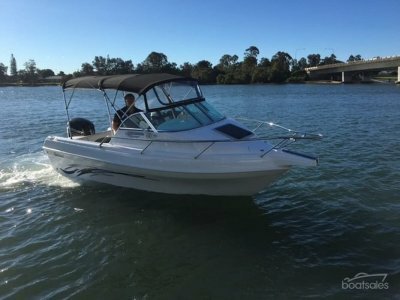 The 565 Offshore has a greater head room then the R Range making the cabin a great napping place or over nighter with the added option of a full bunk infill. 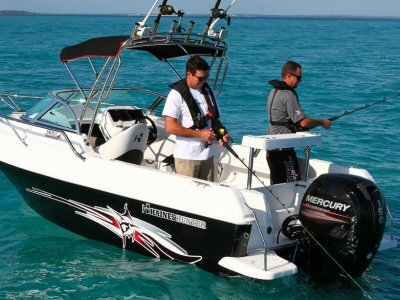 Optional Rocket Launcher, Bimini, Front and Side Clears make for great protection against the elements. The 565 Offshore now comes standard with Anchor Winch, Rope & Chain and looks great when fitted with the optional 32mm Stainless Steel Bow Rail.